The aim is to focus on the world of the child and develop participation, understanding of oneself, other children and the society they are a part of, Laa Po Laa TIE-India will work on developing their powers of expression and communication. Creative Writing – Poems & Songs ,Script writing ,Interviews, Newspaper Designing…many other writing exercises interspersed during the sessions like “Letter to myself ” , “Family poems” , “My dreams” and If I were…etc. To harness the above benefits we have designed the process of Summer Workshop with inclusive all allied arts .. till the end of the day they will get a participation certificate , Spending quality time with experts. 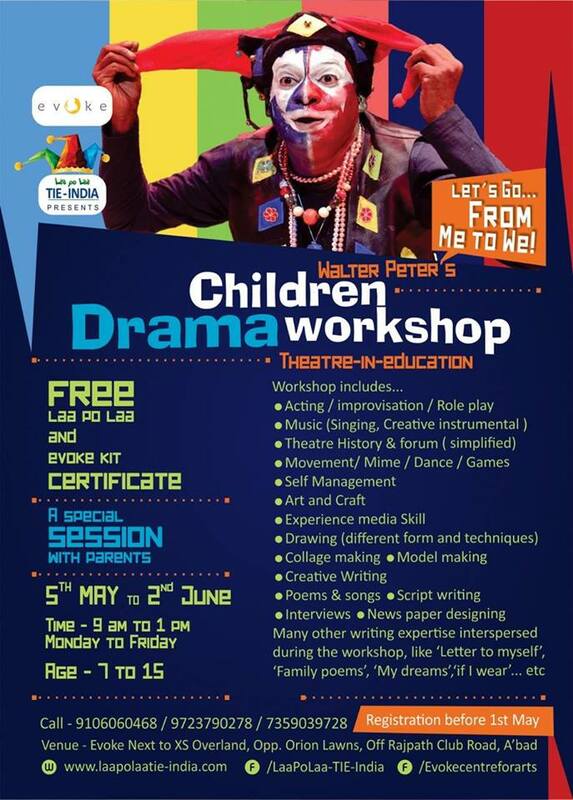 We feel that holistic develop of children can be done through various methods in which this time we are introducing laa po laa process under the guidance and leadership of eminent director-actor Walter Peter who is Ex TIE Co. member of National School Of Drama New Delhi and having his name in Limca book of record for bring 2000 students on stage. The essential idea behind Laa Po Laa TIE- INDIA is to work for and with children to provide an environment to the children themselves, to their teachers and to their parents to use theatre for purposes of education. It does so by creating a space, both mental and physical, where all these stakeholders in the education of our future can open up and understand each other. This has the potential to work wonderfully to address many complicated questions concerning this issue in collaboration with others. It also serves as a forum for sharing the natural curiosity that springs from deep inside. Asking questions, seeking answers, having fun, all of this leads to increasing curiosity, increasing concentrations, developing the co-operative spirit and of living together, learning to accept responsibility, and to take on challenges, to fight hard, to lead a team, to learn to speak and be heard, and see their faith getting a boost. This is the most creative way of education, where no one comes to know when amongst teachers and students, who teach and who learns and what. Personalities keep developing in the right direction even as on the surface it all seems a matter of play. Children find themselves gaining in strength both from within and out. And many kinds of skills also take birth in them that are very important for their life.